It was just spring. And suddenly the radar reports for the central coast of California predicted a storm with icons and colors that screamed out “Cyclone Force, Extreme Weather, Thunder and Lightning and Tornado Conditions”! And it was my work weekend on the Big Sur coast. I actually retired partially a few years ago when we moved from Carmel Valley which was about 50 minutes to work, to a spot off the Morro Highway outside of Atascadero, which is now 2 1/2 hours to work. Needless to say, driving back and forth on a daily basis was not an option. 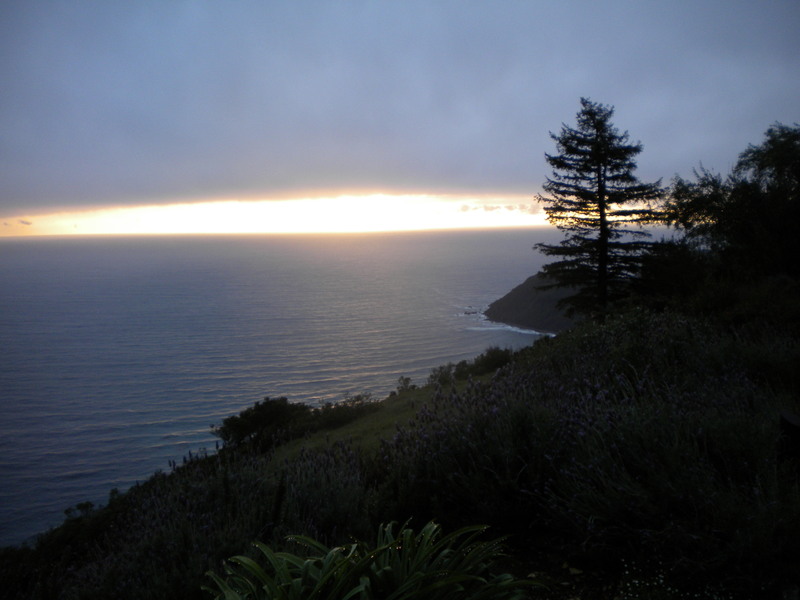 So I go up the coast on Friday morning to the Post Ranch Inn Mercantile, then into Carmel to stay with my friend Alice in the evening – back down to work – back to Carmel – back to work – and head back south and home on Sunday evening. As you can see, I probably travel the 90 miles of the Big Sur coast as much as the UPS guy. It has been my beat for ten years and I tell myself I know all its quirks and idiosyncrasies. Yet that is a dangerous tendency for one never wants to take for granted or become complacent on this most stunning, but treacherous highway. And it always surprises. I am certain that Mother Nature never intended for humankind to build this road. Hike her trails. Share the splendor. Bless the creation. Yes. But blast into her rocky cliffs? Sling concrete across the open spans? Tar and fill, tar and fill, and patch some more? It most likely was never meant to be. 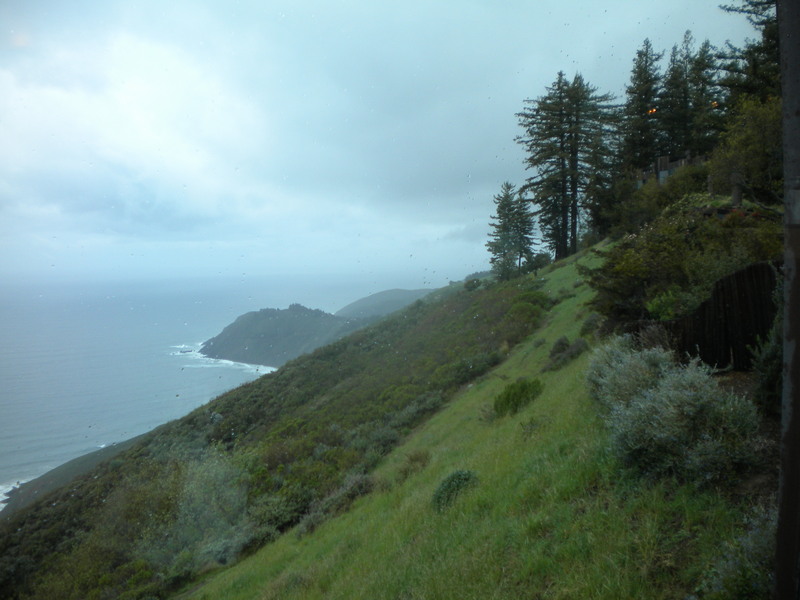 When we actually lived in Big Sur some 30 years ago, a Cal Trans employee told us that the road would never last forever. It was only a matter of time, he said. What motorists didn’t see was the water seeping beneath the concrete, whether from natural springs or rain run-off, running off the cliffs and into the ground as it took its natural course to the sea. And he was right, I believe. There have been previous “slip-outs”, as they are called, before. So the one between my place of work and Carmel which happened BEFORE the storm arrived, was not a first. But the sixty feet of road which just dropped into the sea, obviously inconvenienced a lot of people, tourists and workers alike. Then that cyclone-tornado-thundering force descended upon the Big Sur coast and all Hell broke loose. Again, not a new phenomenon here. And since I was cut off from my usual cozy weekend accommodations, I was fortunate to be “put up” at the notable Post Ranch Inn for the remainder of the weekend. It was the “going home” which was the difficult part. Again, I have traveled Highway One in many conditions over a number of years. It is almost always beautiful and sometimes a little frightening. Having said that, I will take it any day of the week over driving on L.A. freeways. No contest. But this past Sunday wins hand down for most stressful driving experience. So maybe I WILL master my fear of the upcoming thought of Minnesota ice and snow. The first rule to know when driving Big Sur Highway One, is that the rocks are very sharp. Very, very sharp. I don’t drive over anything much bigger than a pebble, even if it means I’m in the wrong lane for 30 miles, or snaking along like a drunken navigator. It’s a type of granite as sharp as glass. And the smaller ones are probably more dangerous than the boulders. Jagged and spikey. And if you don’t follow that rule, you will be one of the unfortunates to be seen by the side of the road struggling with their silly little pretend spares. The second rule to know is that it is only courteous to expect that you will jump out of your car to help clear the path. And this is a particularly sore point for me this week. What were you thinking young man in the small white compact, and you six party animals in the RV (I saw you out on the highway when we were stopped near Lucia by Cal Trans!)? What were you thinking when you stayed inside and watched a woman in her plus 70’s out hefting rocks and small boulders, in the rain and wind, while more rocks rained down from above? And why did you say when I came up to your car, and explained the need to clear a path and the sharpness of the rocks, why did you say “Oh, do you want me to get out and help?” WHEW! I got that one off my chest! So yes, it was a memorably awful drive this week. Maybe the worst I’ve seen. When I got “down the hill” to San Simeon I felt like getting out of the car and kissing the ground. And when I finally got home, I couldn’t wait for a glass of wine and my own bed. I wish I had taken some photos so you could imagine the enormity of it all. But I was too busy hefting and evading rocks. Maybe next time. This entry was posted in storm. Bookmark the permalink. Hi, this is your best ever post!! The pics great! Keep on going, it is so interesting.